I didn't like using the shoulder strap to hold down the sides of my Ortlieb front roller panniers and didn't need it for my usual daily use. 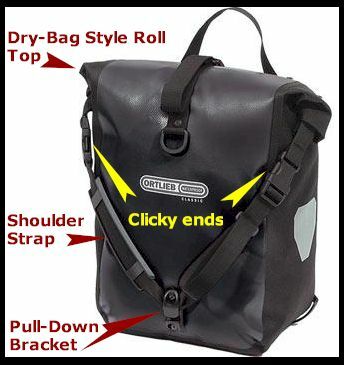 I also felt that doing what a normal person would do, just clicking the sides over the top, worked against the waterproof design of the bag. So I went out and got items that in my mind would create a new and better way of doing things. It was terrible. A failure. These things happen. As much as I dislike this whole "FAIL" thing people do online, I figure I am allowed to FAIL myself. I do so partly because since I am not in any way hip, cool or popular, my doing it might spell the end of this irksome activity for all who wish to be so. In addition, this may represent the most cryptic "FAIL" image I have ever seen. I like that. I know now where my troubles began. I tried to use things I don't love. Like a bird trying to love a nihilist, it just couldn't work. Aluminum crimps? Shock cord? Pull-adjuster things? 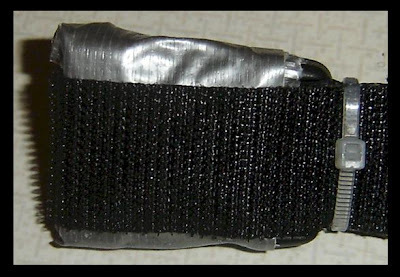 I do like shock cords, but none of these things can come close to how much I like zip ties, and duct tape, and velcro. I love these things. You know sometimes people say of certain foods that you can "taste the love"? If I couldn't find a recipe for pannier hack success with this veritable Holy Trinity of MacGyvering goodness, I never would. The solution I came up with is one in which I totally "felt the love" of zip ties. And duct tape. And velcro. So here's what I did. 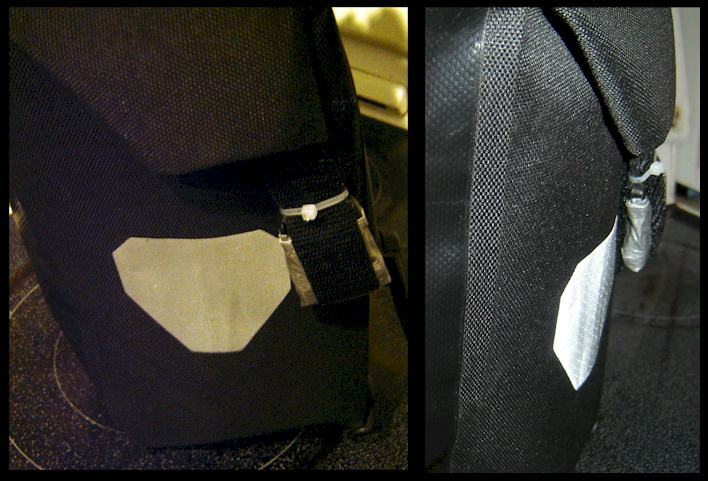 First, I covered the clicky ends of the pannier top with duct tape. 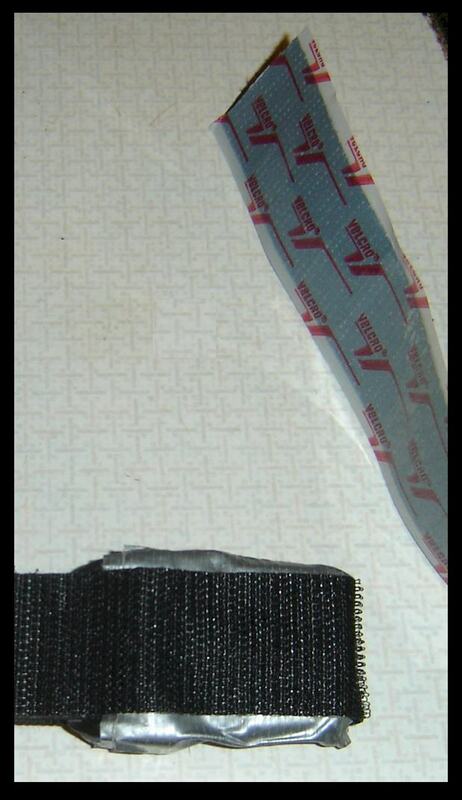 This created a flat stable surface suitable for the application of velcro. I opted for the prickly side for these. Next, some small zip ties to prevent the velcro from curling back or trying to un-stick from the clicky things. Then I tried filling the pannier as full as it go and rolled the top to see where the clicky tabs would land on the side. I then rolled it up empty and checked again. This told me where and how long the velcro "landing strip" should be. Done. It works great and the pannier is very quick to roll and close with these new velcro tabs. What remains to be seen is whether the velcro landing strip will curl or un-stick. I don't want to compromise the waterproofiness of the bag by trying to sew it on. 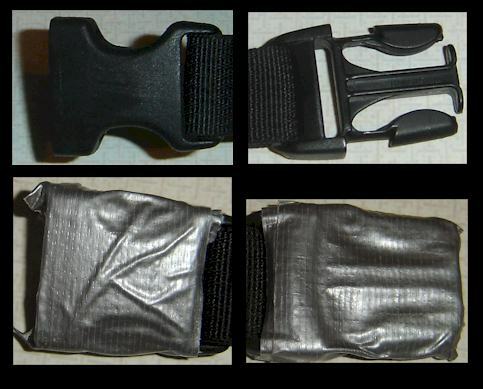 That velcro strip stuff is very sticky, so I have high hopes. Congratulations! Not only have you solved a non-existent problem, you have done so with MacGuyverish panache! It's funny -- I was thinking about your non-problem yesterday. I had a particularly wet commute home, and I clicked the buckles above as usual. No water got inside my pannier, after 30 minutes of riding in the rain. However, a little water had collected on the top of my pannier by the time I got home, in the divots you pointed out. I think it might be a problem with water-resistant fabric, but the Ortlieb material is so waterproof that even standing water isn't going to seep through. Unfortunately, I have a different problem. 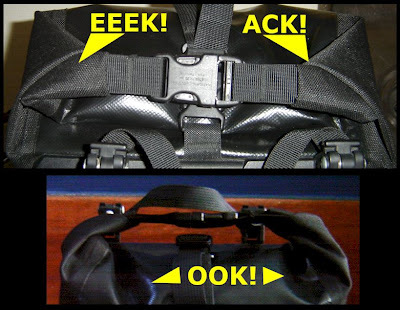 I have noticed those plastic buckles rattling a couple of times. If that keeps up, I'm going to have to do something about it.